What kind of woman becomes the wife of two kings, and the mother of two more? Saxon England, 1002. Not only is Æthelred a failure as King, but his young bride, Emma of Normandy, soon discovers he is even worse as a husband. When the Danish Vikings, led by Swein Forkbeard and his son, Cnut, cause a maelstrom of chaos, Emma, as Queen, must take control if the Kingdom-and her crown-are to be salvaged. Smarter than history remembers, and stronger than the foreign invaders who threaten England’s shores, Emma risks everything on a gamble that could either fulfill her ambitions and dreams or destroy her completely. Emma, the Queen of Saxon England, comes to life through the exquisite writing of Helen Hollick, who shows in this epic tale how one of the most compelling and vivid heroines in English history stood tall through a turbulent fifty-year reign of proud determination, tragic despair, and triumph over treachery. I was going to choose another title but I stumbled upon this by accident. I love the blurb below the title: Sometimes, a desperate kingdom is in need of one great woman. Well, this is being added to the wishlist. Sounds good, thanks for sharing! I hope when you get your book, that you will enjoy it as much as you hope to. Wanna see what I am Waiting On Wednesday for? Ooh nice pick, love the cover. My WOW is at The Crowded Leaf. This one sounds really interesting! I hope you enjoy it. My WoW is Across the Universe by Beth Revis. Happy reading while you wait! This one sounds fascinating! I’m increasingly fascinated to historical fiction set long, long ago. I’m adding it to my list of ones to watch for! 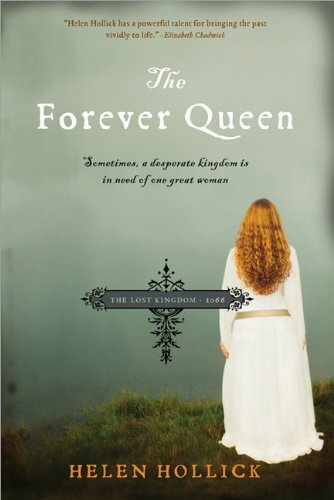 The Forever Queen is totally new to me, but after reading the book’s description, I’m very curious to learn more about Emma of Normandy. Thanks for sharing this WoW pick.